Who’s behind NASA social media accounts ? Take a look for finding the answer and some tips from NASA in cyber space. Are you struggling to get approval for social initiatives? Trying to navigate red tape so you can partner with Foursquare or Gowalla? Well, if Stephanie Schierholz can do it, you can too. Stephanie is responsible for NASA’s main twitter account (@NASA), their popular tweetup account (@NASATweetup) as well as their Foursquare and Gowalla accounts. Since NASA is a huge government agency, Stephanie has to deal with a lot of red tape. NASA has to negotiate their own Terms of Service (TOS) agreement with each social network. Despite bureaucracy and limited resources (Stephanie isn’t just NASA’s social media manager, she’s also the Public Affairs Specialist for NASA’s Office of Communications), NASA is very active in social media, with more than 250 accounts agency-wide. About 130 of those are on Twitter, about 20 of which are astronauts. They also have more than 50 Facebook pages. Stephanie recently spoke at Social Media World Forum in New York City and shared some of the secrets of NASA’s social media success. NASA also maintains over 18 YouTube accounts, 12 Flickr accounts and 5 UStream channels as well as active presences on Foursquare, Gowalla, Slideshare and yes, evenMySpace (naturally). Many brands try hard to maintain one consistent voice online. NASA does the opposite, giving different perspectives from across the agency, from the NASA administrator to theastronauts to the web team “Behind the Page”. Let’s say you want to follow the tweets from astronauts. 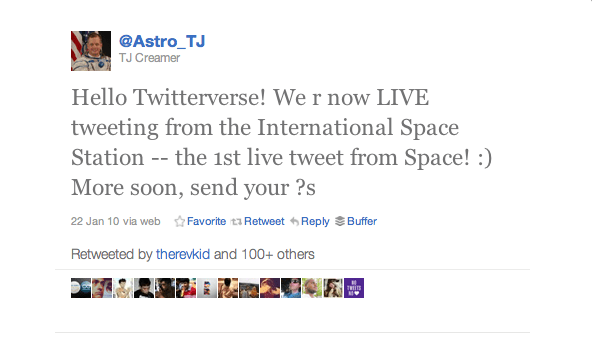 Or maybe you just want to see the tweets from the astronauts in space right now? NASA builds helpful Twitter lists to make it easy for their fans to follow what updates they care about. NASA works hard to digitally and physically bring their tribe inside, allowing them to share in important moments and experiences. NASA held their first chat on December 21st from 12-5 a.m. ET. The chat room was at capacity (250) within 5 minutes of launch until 4:30 a.m. 3,208 questions were received and 2,393 were answered. Overall, 3,174 people participated in the chat. NASA now hostsmultiple live chats on various topics every week. The most successful component of NASA’s social media strategy has been their legendary tweetups. They bring together people who follow NASA on Twitter in real life to meet each other and get a “backstage pass” to NASA itself. NASA Tweetups provide @NASA followers with the opportunity to go behind-the-scenes at NASA facilities and events and speak with scientists, engineers, astronauts and managers. NASA Tweetups range from two hours to two days in length and include a “meet and greet” session to allow participants to mingle with fellow Tweeps and the people behind NASA’s Twitter feeds. Arlo Midgett was a NASA Tweetup participant at the STS-132 Space Shuttle Launch Tweetup at Kennedy Space Center in Florida. Arlo put together a great video of the event that can be seen on NASA’s Tweetup page. It’s working. NASA’s first tweetup was in January 2009 and by February, 2011 they had already held their 15th. For the tweetups, NASA uses a dedicated account @NASATweetup, and a specific hashtag: #NASATweetup. NASA understands the importance of mobile. There is a fully functioning mobile version of NASA.gov and they use HTML5 to make sure the videos render well on mobile. Photos and videos are critical to NASA’s social success. NASA has 18 YouTube accounts,12 Flickr accounts and 5 UStream channels. In 2010, they switched to VMIX, a new video platform that emulates YouTube and according to Schierholz, has made NASA’s videos much more popular. Their fans are watching. They have over 1,500 videos that saw about 7.4 million plays in 2010. NASA designed and executed a fun and engaging location-based partnership with Gowalla, called the “Search for the Moon Rocks” contest. Fans had the opportunity to find and collect four NASA-related virtual items — a moon rock, a NASA patch, a spacesuit and a space shuttle by checking in to NASA visitor centers, agency-related locations, or one of hundreds of museums, planetariums, observatories, parks, zoos and other locations that are part of NASA’s Museum Alliance. The virtual moon rocks were found when Gowalla users checked in to any location where a real one was on display. 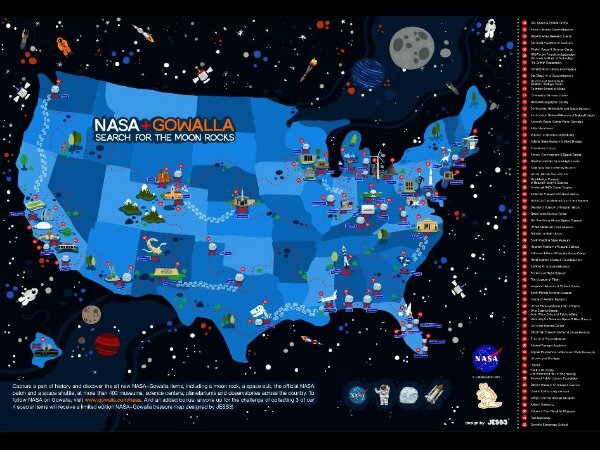 Gowalla and JESS3, a creative agency that specializes in data visualization, created a special edition NASA+Gowalla Map: Search for the Moon Rocks that can be seen below. NASA also partnered with Foursquare. In October of 2010, astronaut Doug Wheelock performed the first ever check-in from space, checking in at the Space Station. 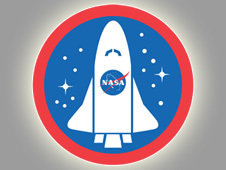 This kicked off NASA’s partnership with Foursquare, as Wheelock unlocked the NASA Explorer Badge. Here is a video of Doug’s check-in. NASA then engaged their tribe by allowing earth-bound users to obtain the same badge by following NASA on Foursquare and checking into NASA-related venues. Stephanie explained that’s it’s important to foster NASA’s space community but it’s not good to try to own the community. To this end, NASA encourages and engages with non-NASA groups like the Space Tweep Society. Stephanie closed her presentation with an appropriate quote from David Rosen. I found a new interesting website called Social Fresh and also this article about online reputation. Great tips&tricks ! According to a report by Internet World Stats, English is the most widely employed language on the internet. However, in order to expand your business internationally a multilingual platform is the best way to reach people globally, using various languages. Daunting as it may seem, building up your online reputation, or ‘brand buzz’, is simple enough with a few useful tips to guide you along the way. Before jumping in the deep end you should think about how you are going to translate your content for markets overseas. While there are numerous free online translation engines, such as Yahoo! Babel Fish and Babylon, by using these you run the risk of misrepresenting your message with linguistic and contextual errors. Employing the skills of a native-speaking translator will eliminate these inaccuracies. Without professional translation, international customers will view your brand as substandard due to the fact that you haven’t taken the time to understand their language coherently to get your message across. Bear in mind that 85 percent of internet users (according to Common Sense Advisory) will not purchase a product online if there’s no information available in their native language. Facebook and Twitter aren’t dominant in every country – in many places around the world there are unique social media which attract the vast majority of social networkers. For instance, if you’re looking to build your brand up with consumers in China, then you would need to build your presence on Qzone and Renren, while Google’s Orkut network is popular in Brazil and India. Rolling out one social media campaign worldwide won’t fit the needs of all the markets you are targeting. This is where you will need to think about the fact that there will be social and cultural differences as well as linguistic differences. A campaign that is specifically targeted at your Chinese audience won’t have any relevance to your American audience and viceversa. For instance, you need to make sure that your updates are relevant to their audience – does the audience in China care about a new product launch in the UK? And are you best utilizing the medium for your target audience – for example, Old Spice Guy worked perfectly for a western audience, however many Indians like to use social media as a self-promotional tool for their singing careers; you could harness the crowd’s desire for recognition. Social media is a conversational medium, and whether you receive negative or positive feedback you should take the time to respond, and do so in a professional manner. The way you respond can massively affect your online reputation, so it shouldn’t be taken lightly. Fair complaints should be responded to honestly. If an internet user notices a fault that you are working on, reply back with pointers on how you are solving the issue. If, however, the complaint is unfair take the time to give your side of the story positively. Avoid a war-of-words scenario, which will negatively impact your reputation. 5. What do you want to communicate? When building an international online reputation it is vital that you know what it is you want to say to your audience. Furthermore, it should be interesting and should be communicated in bite size amounts for people to process easily. Break down your key messages and aims (conversions, enquiries) and look at how you can communicate these messages in a way which will be readily received by your various international target audiences. Should you be running competitions and giveaways, producing video content, or offering interactive content/games? In producing and disseminating quality content, you’ll also need to heed cultural differences. For example, Germans are more concerned when it comes to their data security on social networks, while the Chinese are big fans of free downloads and the Japanese are more willing to pay for quality content compared to other countries. A good tool to use is monitorThis, as it allows you to monitor where your brand is being mentioned in 25 different search engines. Another tool to consider using is Keotag, which alerts you to any blog posts that have tagged you, by using collected data from numerous search engines. One other source to use is RepVine, which allows you to monitor information about yourself and others, all of which helps you to keep track of, and enhance, your business reputation online and through social media.